Over 150 years after her death, a widely-used scientific computer program was named “Ada,” after Ada Lovelace, the only legitimate daughter of the eighteenth century’s version of a rock star, Lord Byron. Why? In Ada Lovelace, James Essinger makes the case that the computer age could have started two centuries ago if Lovelace’s contemporaries had recognized her research and fully grasped its implications. Based on ten years of research and filled with fascinating characters and observations of the period, not to mention numerous illustrations, Essinger tells Ada’s fascinating story in unprecedented detail to absorbing and inspiring effect. JAMES ESSINGER is a writer with a particular interest in the history of ideas that have had a practical impact on the modern world. His previous book, Jacquard’s Web: How a Hand-Loom Led to the Birth of the Information Age (2004), was chosen as one of the top 5 popular science books of the year by the Economist. “Essinger is a terrific storyteller, and he knows a great story when he sees it. 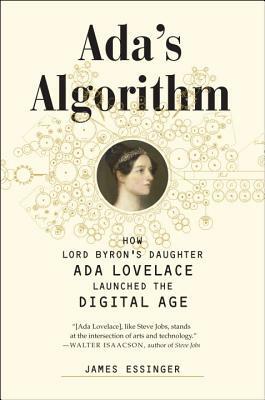 Ada’s Algorithm is a riveting read." “Irresistible ... If more people could have understood Babbage's machine the way Lovelace did — indeed, if they had not all but ignored her paper, perhaps because the author was a woman — computing might have had a far earlier start." “A portrait of a particularly fascinating woman." “A window on the life of one of the world's first celebrity scientists." “An absorbing account of a woman who was far ahead of her time." “The biography contains just the kind of moments of triumph I like to read about: Ada overcoming obstacles to get an education and make genius contributions to science." “The title says it all. Badass tech ladies rule." “Readers are treated to an intimate portrait of Lovelace’s short but significant life along with an abbreviated history of 19th-century high-society London." “If you want to focus on just one singular genius, start with this story. It’s about a woman who was born to notoriety, as Lord Byron’s daughter, who ended up writing the first computer program and changing the world." “Essinger describes [Lovelace's] life with obvious respect, perhaps admiration, but also with a careful sense of journalistic objectivity and precision." “Stepping out of the long shadow of Lord Byron's legacy, Essinger follows the visionary mind of Lovelace as she, applying her educated mind to the 'Analytical Engine,' creates the first recognized algorithm and casts a shadow on modern technology as long as her father's on poetry." “[Essinger] presents Ada’s story with great enthusiasm and rich detail… Ada continues to inspire, and by using her own voice via letters and research, the author brings her to life for a new generation of intrepid female innovators. A robust, engaging and exciting biography." “Absorbing... Essinger’s tome is undergirded by academic research, but it is the author’s prose, both graceful and confident, that will draw in a general readership. Readers are treated to an intimate portrait of Lovelace’s short but significant life...along with an abbreviated history of 19th-century high-society London." “The author provides an engaging...look at [Lovelace's] parents’ romance, her childhood, her lifelong fascination with mathematics, and, mostly, her friendship with [Charles Babbage]."